The desire to keep government open and transparent, so that the rest of us can look in there and see what’s going on, is often in tension with the preference for secrecy common to people in high places — or low ones. That second urge is natural: Lots of people want to peek in the neighbor’s house, but most don’t like it when their neighbors peek. The first urge is important. You ought to be able to see what elected and appointed officials see when they’re making decisions: who they’re talking to and about what, what they’re reading, what their aides are telling them, which lobbyists and contractors and other favor-seekers are lurking. The two urges regularly confound legislators, whether they like the idea of open government (most do) or they’d like to meet privately once in a while to hash things out without public eyes (most of them). Both ideas were in evidence Friday at the Texas Legislative Conference in New Braunfels. A panel featuring Sens. Paul Bettencourt, R-Houston, and Kirk Watson, D-Austin, (I moderated) turned to open-government matters; Watson is sponsoring several bills, with Bettencourt as a supporter. Some of that legislation is up for debate within the next few days, and the two emphasized the importance of open government. 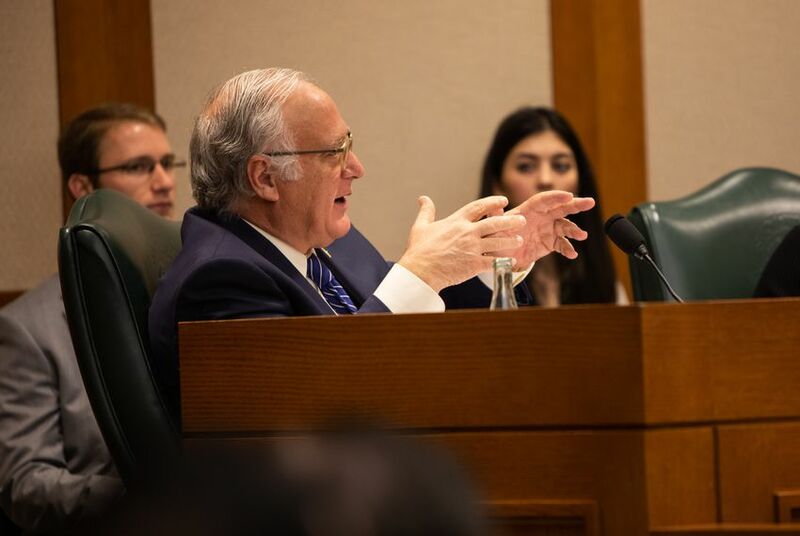 It’s not the first time around for the Austin Democrat, who’s been backing open-government legislation for years and who finds himself trying to win fights this year that he has fought in previous sessions. And Bettencourt, a conservative member of the majority party in Texas, is right there with him. In fact, Watson’s problems passing some of his legislation have happened on the other end of the Capitol building, where bills approved in the Senate have gone to die. Bettencourt was incredulous that anyone would want anything but open and transparent government. A few minutes later, Lt. Gov. Dan Patrick — who has also been a strong voice for open government — made the other point. He wasn’t arguing against transparency, open records or open meetings. But he was telling the same group about how well the state’s top leaders have been getting along, about how — in spite of their differences — they’ve been able to present a united front through the first half of the current legislative session. “We can disagree behind closed doors, but we’re not going to do it where the media can rip us up,” he said. Somewhere in there is the proper balance between transparency and discretion, between free-for-alls and statecraft, between protecting and thwarting the public interest. And to top it all, a few hours later, Robert Mueller III, the U.S. special counsel, turned his investigative report over to Attorney General William Barr. What do you think of open government now? Consider the case of “walking quorums.” If enough members of a public panel, commission, committee, or legislative body get together to make official decisions — if, in other words, they have assembled a quorum — they have to call their meeting in advance and tell the rest of us what they’re doing. That gives us time to go watch and listen if we want to. One way around that kind of scrutiny is for the members of a public body to talk to each other in small groups — smaller than a quorum, so they don’t have to operate in the open — before their open, public meeting. They can be all smiles, get their prearranged business done, and go happily on their way. Walking quorums were illegal until a recent ruling by the Texas Court of Criminal Appeals, which said the law against them was “unconstitutionally vague.” Watson said he didn’t disagree with the logic of the ruling, but he clearly didn’t like the final result; on Monday morning, he’ll be asking other senators to support legislation that would make walking quorums a crime — like they were until a few weeks ago. Watson will be in another committee on Tuesday, presenting legislation prompted by court rulings on what is and is not secret when the government privatizes some of its business in contracts with private firms, or when quasi-government agencies get involved in economic development negotiations. Those are known generally as the Boeing and the Greater Houston Partnership decisions. Those are among several open-government bills up for consideration this week. State Rep. Giovanni Capriglione, R-Southlake, is carrying companion bills in the House; they got hearings last week. Think of these as efforts to kick open the doors, so Texans can see what’s being done in their names and with their treasure. Lots of what’s back there is boring. But lots of it is expensive or important or both. And it’s not their stuff — it’s yours.